Find out more about website solutions - How Augmented Reality can be developed into a site. Carpe diem. Create Augmented Reality. Augmented Reality solutions are swiftly gaining popularity, so it's time to ride the wave of the world wide web and transform your marketing communications. We adopt an augmented system that is so visually captivating that users will be drawn to it in multitudes. Sounds exciting don't you agree? Augmented reality websites become a great portal of communication and spring companies straight into 21st century technologies. When used effectively, AR will give an organisation great balance of brand promotion, useful features and a communication tool all in one bespoke application, all this without even breaking a sweat? That's right, no stress just sit back and watch the designs transform into developments. 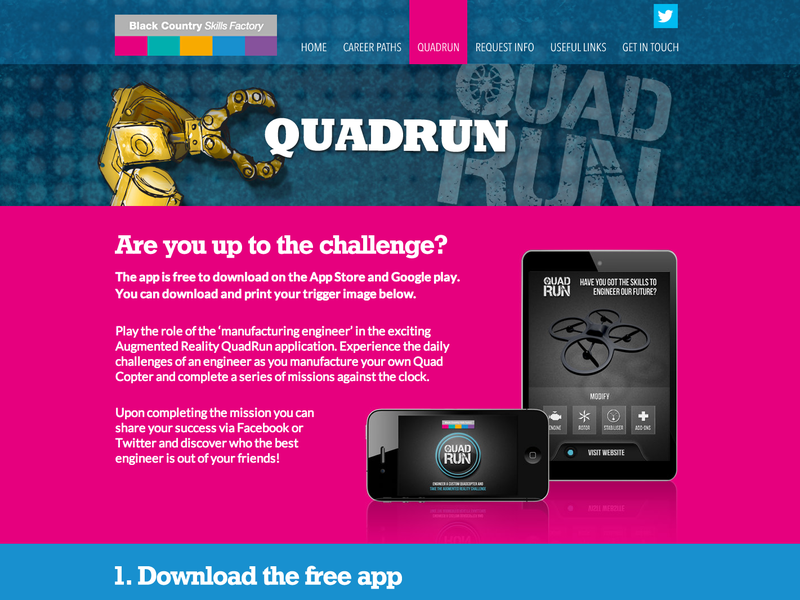 Micro sites like Quadrun (an augmented reality app we created and launched) have paved the way for the future not only for technology but for education and future career choices. If you bear in mind that augmented reality is in a constant cycle of advancement. This means that the websites we create will not be stuck in an outdated era, we ensure the most innovative technology and styles are used to create the perfect digital communication tool. We believe one of the most useful advantages of augmented reality is the ability it provides for users to test out virtual products at the touch of your hands, particularly useful in retail with clothing, jewellery and home appliance sectors. Providing an effective interactive selling tool and delivering customers with great sense of ownership before those all important purchase decisions are processed. Augmented Reality software can further strengthen a company’s brand. Through our extensive work, we strive for customers to have a recognised, trustworthy brand relationship with their clients. With this as a leading point we're confident that certain barriers such as product or service cost may be overcome. Augmented Reality solutions enable a pioneering front amongst a range of sectors, allowing for us to integrate this awesome piece of technology in different environments and scenarios. An Augmented Reality website allows brands to customise and control how they're perceived with a few simple clicks from our development team. Giving organisations chance to be fully expressive in every sense, in terms of what they’re offering and how it can benefit consumer’s lives. All this information communicated via smart device (pause for wow's). Creating an Augmented Reality platform can utilise already present marketing materials such as direct mails and support products catalogues too! Perfect if you're looking to save a few pennies. Isn’t it great to know that most of a company’s products can be adapted for Augmented Reality applications even more reason to discover more! Augmented Reality affords us with a chance to even go above and beyond with our services advertising through even the simplest of things. If you'd love to hear more about how we can develop you a creative Augmented Reality website contact the office and we'll guide you to the success of Augmented Reality.